Students of East African history understand how, from the beginning of European intrusion, transport was pivotal to development. Unlike any other newly opened region in the world, all transport was restricted to the capability of the human porter. The history and romance of how this dependence was broken by the making of the railways has been well served in literature. But the purpose of the railways was to open up the great waterways - primarily Victoria, Tanganyika and the Nile route, and this great maritime enterprise has so far been neglected in the literature: yet, astonishingly, within 25 years of the launching of the first steamer on Lake Victoria, the whole concept of the Nile route was challenged by Sir Alan Cobham's flying boat. It is against this background that these two fine books from Runnymede Malthouse Pubhshing are to be welcomed. Both are completely authoritative, being written by men personally involved in the business; meticulously researched, they address their subjects with clarity of style, easy readability and a strong injection of romance and humour. 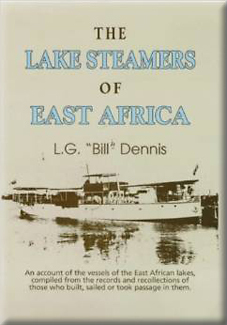 In The Lake Steamers of East Africa L.G. Bill Dennis takes us from the days of Speke's discovery of Lake Victoria, through the missionaries' brave struggles with sail, to the heroic carriage from the coast by porters of the 70 ton steamer William Mackinnon in 3000 separate head loads. The courage of these early engineers must leave us humbled. From nothing, shipyards and docks were created, and with the completion of the railway the famous Lake Victoria fleet, including the Sybil, Usoga and Rusinga, of which older readers will have happy memories, were launched upon the inland sea. The East African Railways & Harbours organisation became the jewel in the crown of the British period in equatorial Africa and Bill Dennis has done it full justice, both as a strict historian and relaxed raconteur of the human and humorous aspects. Students of the period will be particularly grateful for his fascinating archival photographs and the chronological appendix giving details of all known vessels on the lakes. Archival photographs are an equally fascinating feature of Peter Davis' East African: An Airline Story, and perhaps the most nostalgic and ironic of them is his first, which shows Sir Alan Cobham's flying boat lying off Entebbe in 1928, being greeted by a fleet of Bagandan war canoes: the ancient, sadly dying, culture faced with the dynamic shape of things to come. Like Dennis, Davis takes us on a technical but thrilling and very human history, from the hit and miss days of early settler flying, through the start of Wilson's airline and the brief age of the flying boats ( a never-since-attained acme of gracious travel) to the world of the jets. Quite apart from the deep interest to those of us whose careers paralleled this progress, the book is a marvellous insight for any modern air traveller into what makes an airline tick and enables us to reach our destination safely. Neither of these books can be said to have a happy ending. 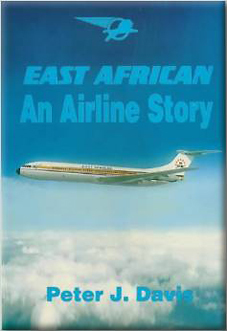 Faced with the problems of politically correct africanisation and a process of inept political vandalism that resulted in the break-up of the East African Common Services, the steamers were left in decline and the airline in disintegration. The authors do not shirk this down-side to their stories, and we must be grateful to them for so ably setting down for posterity a period of high endeavour of which our country should be proud.